In the beginning of 2018, RAB joined forces with the International Institute of Tropical Agriculture (IITA)and Bioversity International on three different initiatives that target to combat Banana Xanthomonas Wilt (BXW) disease in Rwanda: CIALCA, ICT4BXW, and RTB Scaling Fund. Although each of the projects has a specific approach and focus, they all have one common objective: to improve the lives of banana farmers in Rwanda. CIALCA has a long history of banana research-for-development in in Rwanda which has led to the development of various innovations. One such innovation is Single Diseased Stem Removal (SDSR), a technology that helps combat BXW. Nevertheless, BXW remains a serious challenge in the Great Lakes region and impacts millions of farmer households. Rwanda is no exception to this, and hence the fight against BXW disease is not yet over. Funded by the Belgian Ministry of Foreign Affairs, Foreign Trade and Development Cooperation, CIALCA continues to invest in banana-systems in its fourth phase (2017-2020), aimed at reducing BXW incidence as well as addressing the impact of BXW on productivity, income, and food and nutrition security. As in earlier phases, an important pillar of CIALCA is to develop the capacity of MSc- and PhD-researchers in the Rwanda national agricultural research system. The ICT4BXW project uses citizen science, mobile Information and Communication Technology (ICT), and Geospatial Information Systems (GIS) to support interaction between banana farmers, extension service providers and policymakers to improve BXW prevention and control. ICT4BXW is led by IITA and implemented in partnership with Bioversity International, RAB, and Leibniz Institute of Agricultural Development in Transition Economies (IAMO). Funding is for three years (2018-2020) and comes from the Deutsche Gesellschaft fur Internationale Zusammenarbeit (GIZ) on behalf of the German Federal Ministry for Economic Cooperation and development (BMZ). The project develops, pilots and tests the use of ICT tools in Rwanda to improve decision-making about appropriate BXW management. Furthermore, the project aims to develop an early warning system that uses geo-referenced data to inform intervention strategies and prevent new disease outbreaks. Three years from now ICT4BXW will have tested the use of ICT tools with at least 50 Rwandan extensionists thereby reaching at least 5000 farmers in four provinces. RAB-colleague Michel Kabirigi is conducting his PhD-studies with IAMO in Germany as part of the project. In addition, the project provides MSc-thesis research opportunities for Rwandese students. 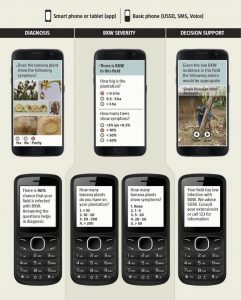 Figure 1: An example of the apps that the ICT4BXW project will develop and test. With support from the CGIAR Research Program on Roots, Tubers and Bananas (RTB), Bioversity International is leading one of three projects that seek to scale promising agricultural innovations. In partnership with IITA, and national partners in banana systems in Uganda, DR Congo, Burundi, and Rwanda, the project aims to promote the use of Single Diseased Stem Removal (SDSR) technology as an effective means to address BXW in smallholder farms. 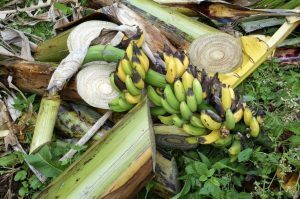 The SDSR management package includes continuous field monitoring, cutting down of diseased banana stems, sterilization of tools, and removal of the male bud from healthy plants. The cutting of individual diseased stems is much less invasive than the common Complete Mat Uprooting (CMU) practice. Yet studies show that SDSR can reduce BXW incidence to less than 2% within 3 months. The project’s goal is to reach 37,000 households in the target countries. For Rwanda, Bioversity International, IITA and RAB are bringing SDSR to the attention of policymakers and development partners as a scientifically-proven alternative for CMU that can increase banana productivity for farmers throughout the country. A first output from the three initiatives on BXW is a diagnostics paper that was published in a special issue from NJAS – Wageningen Journal of Life Science. The article provides a holistic analysis of the BXW problem in Rwanda based on literature review and scoping studies. 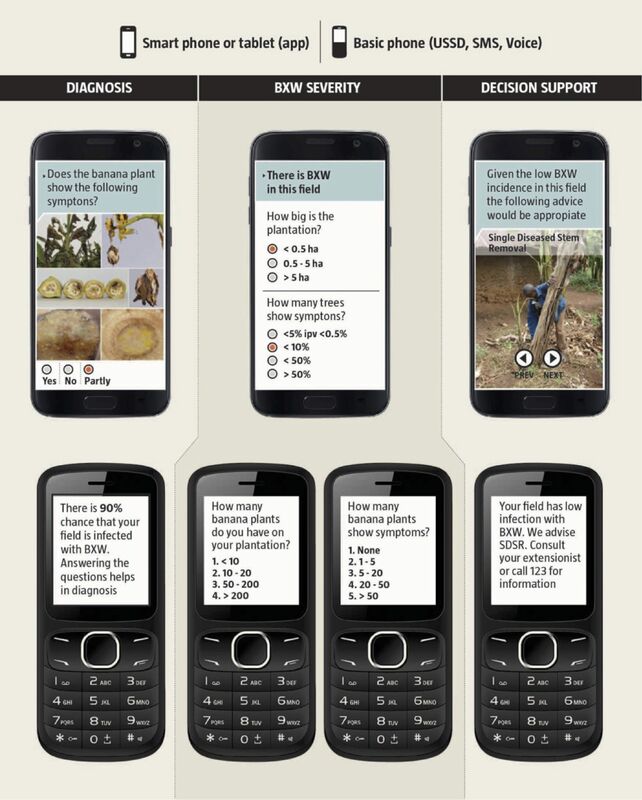 It also examines how ICT and citizen science could contribute to addressing the problem. Dr. Svetlana Gaidashova, head of RAB’s banana program, is a key co-author on this article. Currently, research frameworks and an integrated Monitoring, Evaluation and Learning (MEL) framework are being developed to support collection of scientific evidence about the outcomes and impacts of interventions. Additionally, baseline studies with farmers and extensionists are planned for the third quarter of 2018, while the ICT4BXW project also plans to develop and prototyping mobile apps in participation with end users towards the end of the year. We are excited about these individual projects, the synergy that they have together, and the strong partnership between RAB, CGIAR research centers in Rwanda and (inter)national Universities. These initiatives will help RAB to receive feedback from farmers and provide recommendations more rapidly than has ever been done, and thus we expect that banana disease control (BXW) will become more efficient.